Here is another thing Grandma Lisa made for Cooper. It is so adorable! She also made my sister andI bedspreads like this when we went away to college. 1. 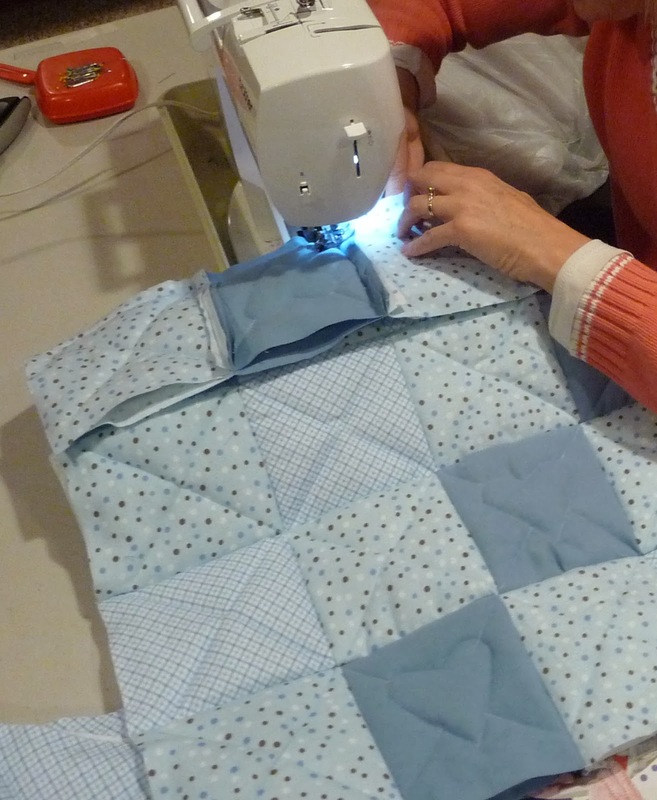 First decide how big you want your quilt to be, to determine how much fabric you’ll need. For this particular baby quilt I did 6 inch squares which after being rag quilted (with a 3/4” seam allowance) turned into 4 ½ ” squares. This makes approximately a 28” X 40“ quilt. This quilt was made with 7 squares by 10 squares. 2. After you determine the size of blanket you want and how many squares it’ll be: you’ll need that many squares of flannel/batting, and twice that many squares of fabric. So for this blanket of 7 X 10 squares you will need 7×10 = 70, so you will need 70 squares of flannel, and twice that many to do both sides. 1 yard of fabric made 42 – 6” squares so you need to decide how many colors you want for your quilt and decide how much fabric you will need for each color. I used 3 different fabrics for mine. If you are using batting, then sew an “X” across the sandwich to quilt them together, or it will ball up. If you’re using flannel, you don’t need to quilt it together, just put the three layers together for now. 6. After you have all your sandwiches assembled into rows, try to line up the seams as best as you can from one row to the next. Then sew the rows together the same way you did the sandwiches, with raw edges turned up. Set your stitch length to a small number, to make it a stronger. 7. After you’ve joined all rows, sew a 3/4 ” line all the way around the edge of the quilt. Now cut equal snips in the seam allowances, getting close to the seams, but not snipping through them. 8. After you’ve snipped towards all the seams, toss the blanket into the wash. Dry the blanket on high heat to help it fray more and become soft and fluffy. Some people like to do this at a Laundromat because it does produce a LOT of lint. If you do this at home, just pause the drying cycle and empty the lint trap a time or two in the middle of the cycle. 9. When you remove the blanket from the dryer, take it outside and give it a good shake to get rid of spare loose threads. You may also use a tape roller. This is a good time to double check that all of your seams are still in place,(that there are no “holes”). If you accidentally snipped into a seam line, it will have come open in the wash. If that’s the case, simply re-sew that seam in place and you’re good to go. The more you wash and dry this blanket, the fluffier and more frayed the seams become. concept down, here are some variations of rag quilts to give you some inspiration! Last weekend a friend showed me her rag quilt she was making and I loved it. Your tutorial is just what I was looking for! Thanks!! Following you all now! neat! I am going to try this. Love the little heart square, show the love! Great tutorial! Thanks for linking up while I hosted Anything Goes Mondays! Beautiful! Thanks for sharing @ Monday Handmade Linkup Party. I LOVED this quilt pattern. I featured it on the FaveCrafts blog with full credit to you! See it here: http://www.favecrafts.com/blog/fc/rag-quilt-patterns/. Doesn’t the fraying cause it to come apart after a time of several washes? Plus what if a piece of the fabric threads get in their mouths. I would think they could choke. Please tell me what material you use that does not Fray to the point of bunched threads, or loose ones. I love how easy it is and how down to home it looks but worried about above items happening.